The Tiberian vocalization, Tiberian pointing, or Tiberian niqqud (Hebrew: נִיקוּד טְבֵרִיָנִי Nikkud Tveriyani) is a system of diacritics (niqqud) devised by the Masoretes of Tiberias to add to the consonantal text of the Hebrew Bible to produce the Masoretic Text. 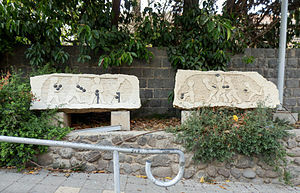 The system soon became used to vocalize other Hebrew texts, as well. The Tiberian vocalization marks vowels and stress, makes fine distinctions of consonant quality and length, and serves as punctuation. While the Tiberian system was devised for Tiberian Hebrew, it has become the dominant system for vocalizing all forms of Hebrew and has long since eclipsed the Babylonian and Palestinian vocalization systems. The sin dot distinguishes between the two values of ש. A dagesh indicates a consonant is geminate or unspirantized, and a raphe indicates spirantization. The mappiq indicates that ה is consonantal, not silent, in syllable-coda position. Shva was used both to indicate lack of a vowel (quiescent šwa, shva nah) and as another symbol to represent the phoneme /ă/ (mobile šwa, shva na), the latter also represented by hataf patah. The phoneme /ă/ had a number of allophones; /ă/ had to be written with shva rather than hataf patah when it was not pronounced as [ă]. Before a laryngeal-pharyngeal, mobile šwa was pronounced as an ultrashort copy of the following vowel (וּבָקְעָה [uvɔqɔ̆ʕɔ]) and as [ĭ] preceding /j/, (תְדֵמְּיוּ֫נִי /θăðammĭjuni/). Using ḥataf vowels was mandatory under gutturals but optional under other letters, and there was considerable variation among manuscripts. If one argues that the dalet of 'Mordecai' (and other letters in other words) has hatef qames, tell him, 'but this sign is only a device used by some scribes to warn that the consonants should be pronounced fully, and not slurred over'. The names of the vowels are mostly taken from the form and action of the mouth in producing the various sounds, as פַּתַ֫ח opening; צֵרֵ֫י a wide parting (of the mouth), also שֶׁ֫בֶר=ĭ) breaking, parting (cf. the Arab, kasr); חִ֫ירֶק (also חִרֶק) narrow opening; ח֫וֹלֶם closing, according to others fullness, i.e. of the mouth (also מְלֹא פּוּם fullness of the mouth). קָ֫מֶץ also denotes a slighter, as שׁוּרֶק and קִבּוּץ (also קבוץ פּוּם) a firmer, compression or contraction of the mouth. Segôl (סְגוֹל bunch of grapes) takes its name from its form. So שָׁלֹשׁ נְקֻדּוֹת (three points) is another name for Qibbúṣ. Moreover the names were mostly so formed (but only later), that the sound of each vowel is heard in the first syllable (קָמֶץ for קֹמֶץ,‎ פַּתַח for פֶּתַח,‎ צֵרִי for צְרִי); in order to carry this out consistently some even write Sägôl, Qomeṣ-ḥatûf, Qûbbûṣ. Cantillation signs mark stress and punctuation. Metheg may mark secondary stress, and maqqaf conjoins words into one stress unit, which normally takes only one cantillation mark on the final word in the unit. ^ The portions of the Hebrew Bible in Biblical Aramaic use the same system of vocalization. Joshua Blau (2010). Phonology and Morphology of Biblical Hebrew. Winona Lake, Indiana: Eisenbrauns. ISBN 1-57506-129-5. Yeivin, Israel (1980). Introduction to the Tiberian Masorah. Scholars Press. ISBN 0-89130-373-1.